This quotation is one of many introductory narrations of the Twilight Zone series. It contantly reminds me of the various “realities” that I have expierenced throughtout the trip. Obivously, I am in a different world because I’m in China, but it is the strange and complex polemic layers that transforms a situation, moment, or place into this undescribable limbo. The most recent event was when I visited Songjiang Province’s Thames Town. Thames Town’s creation relates to the larger issue of Shanghai’s sprawl. Because the government understands its consequences, it has implemented satellite towns such as Songjiang and Qingpu as new city centers that will eventually build up with density. Rather than travelling from the outskirts of Shanghai into the city, one’s workplace will be in the new satellite city center. Then, infrastructure will start connecting the satellite towns to greater Shanghai. The success of these satellite towns is still to be determined, but regardless, it is exciting to see a city in the in between stages of development. This stage is caught between light and shadow, superstition and science, fear and knowledge. It applies from the macro Shanghai to the indvidiaul town. On the city scale, I’m temporarily thrown into these unknown worlds and then yanked back out as I return to Shanghai. Despite its adoption of another city’s context, there was no other human life form in the town other than my peers and the occasional photo entourage. I can’t classify this as a ghost town like the Wild West because there wasn’t mad rush to physically be there and a slow decrease of residents that eventually leaves a town empty. The only rush was to buy the property. With only a 20% occupancy rate, the mix-use retail that underneath struggled to stay in business after its first year. Now the majority of the street level retail is empty or taped up with the exception of some photography studios profiting from picturesque glamour shoots. On paper as an urban and marketing strategy, it is a great idea to theme many of these towns after European cities. The housing units become limited edition collectors items. Others see Thames Town as an affordable way to “leave” the city and take their wedding photos in a British backdrop. Sure this area was able to sell all its units in 48 hours, but how sustainable is it to create an artificial town with the vital ammenities with no one to inhabit it, compared to the naturally occuring developments located in the outskirts of Shanghai where people have to travel to and from the city center everyday? It is especially strange to me that the immediate context outside of Thames Town is thriving and oozing with activity that this expensive real estate development lacks. Thames Town is a the a “real” Twilight Zone where it is built to be a functioning part of the city, but is missing the actual inhabitants to allow it to flourish. In a wedding photo, it could be taken in England 10+ hours away, but in reality its only a 45 minute drive from Shanghai. 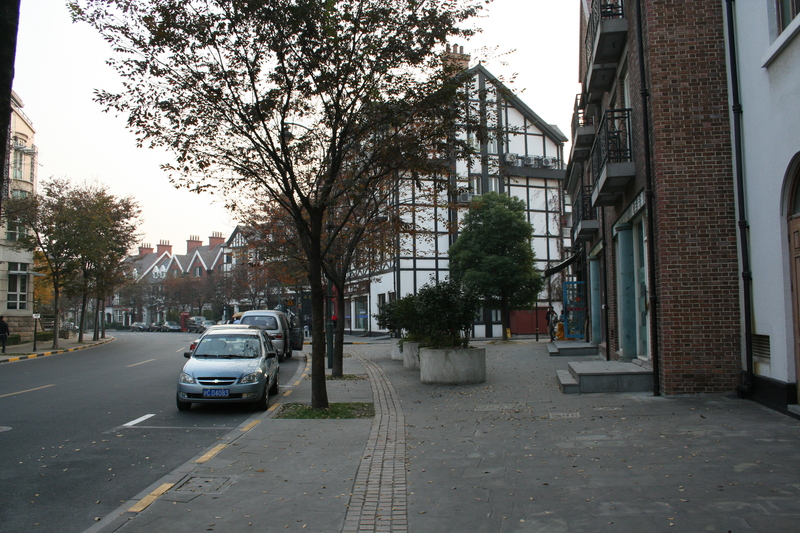 It’s a great copy of a British town, but right outside is Songjiang, a satellite town of Shanghai. Shanghai is in the “communist” People’s Repulic of China, but given its growing economy, China has adopted a Western influenced aesthetic for branded goods and lifestyle. If I had to REALLY describe Thames Town, I couldn’t because of its multiple and complicated twists of contradictions. The oveall ambiguity of categorizing and labeling Thames Town makes it this Twilight Zone. But then, does everything with multiple polemical layers be categorized as the Twilight Zone? Maybe Thames Town was made as this accentuation of the Chinese addiction to imported culture. In that case, those who know about this are extremely amused and entertained.